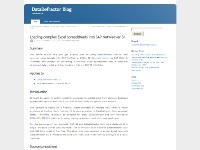 Details: This article helps to get a quick start on using DataDefractor Solo to load complex spreadsheets into SAP NetWeaver Business Intelligence (formerly known as SAP BW). It illustrates the process of converting a financial Excel spreadsheet into a structured data model and loading it into an InfoCube. The tutorial is well organized and shows how to load Excel into SAP in a very straightforward way - with a lot of screenshots and example data.